First Satellites colliding, now this. Two nuclear submarines carrying nuclear missiles, the British HMS Vanguard—in the image—and the French Le Triomphan, bumped in the Atlantic this February. Recently, the two submarines came into contact at very low speed. Both submarines remained safe and no injuries occurred. We can confirm that the capability remained unaffected and there has been no compromise to nuclear safety. 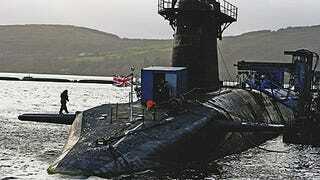 HMS Vanguard returned safely to Faslane under her own power on 14 February. The incident may have happened around February 3 or 4. The submarines, each of them about 150 metres long and 13 metres in diameter, had 250 sailors inside and 16 35-ton intercontinental ballistic missiles missiles, with a 5,000-mile range. The Royal Navy says there was no real danger and the nuclear safety of the UK arsenal—no word from the Frenchies—was never compromised. However, according to a senior Royal Navy source, "it's very unlikely there would have been a nuclear explosion. But a radioactive leak was a possibility. Worse, we could have lost the crew and warheads. That would have been a national disaster."